Candida infective endocarditis (IE) is uncommon but often fatal. Most epidemiologic data are derived from small case series or case reports. This study was conducted to explore the epidemiology, treatment patterns, and outcomes of patients with Candida IE. We compared 33 Candida IE cases to 2,716 patients with non-fungal IE in the International Collaboration on Endocarditis—Prospective Cohort Study (ICE-PCS). Patients were enrolled and the data collected from June 2000 until August 2005. We noted that patients with Candida IE were more likely to have prosthetic valves (p < 0.001), short-term indwelling catheters (p < 0.0001), and have healthcare-associated infections (p < 0.001). The reasons for surgery differed between the two groups: myocardial abscess (46.7% vs. 22.2%, p = 0.026) and persistent positive blood cultures (33.3% vs. 9.9%, p = 0.003) were more common among those with Candida IE. 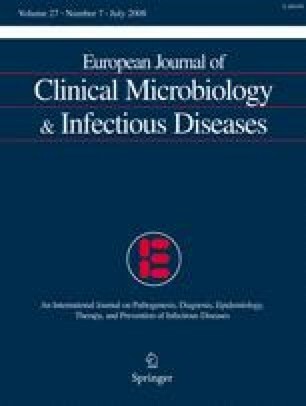 Mortality at discharge was higher in patients with Candida IE (30.3%) when compared to non-fungal cases (17%, p = 0.046). Among Candida patients, mortality was similar in patients who received combination surgical and antifungal therapy versus antifungal therapy alone (33.3% vs. 27.8%, p = 0.26). New antifungal drugs, particularly echinocandins, were used frequently. These multi-center data suggest distinct epidemiologic features of Candida IE when compared to non-fungal cases. Indications for surgical intervention are different and mortality is increased. Newer antifungal treatment options are increasingly used. Large, multi-center studies are needed to help better define Candida IE. ICE-PCS Group investigators are listed in the Appendix. This study was sponsored in part by a grant from Merck and Co., Inc. The sponsor had no role in the design and the conduct of the study, or in the collection, analysis, and interpretation of the data. Research support from NICHD K23HD-0044799 (DKB). JWB: Research support from Astellas and Merck, Inc. Speaker’s bureau for Merck and Enzon. Consulting services for Pfizer and Enzon. DKB: Research support from Astellas, Pfizer, Inc., Biosynexus, Cape Cod Associates, Inc., Johnson & Johnson, and Astra Zeneca. Fellowship support from Johnson & Johnson and MedImmune. All monies go to Duke University. Dr. Benjamin does not own any stock or hold financial interest in any organization listed above. BB: Grant support from the Croatian Ministry of Science, no. 108-1080002-0102. Consulting services for Pliva Pharmaceuticals. Speaker’s bureau for Pliva Pharmaceuticals, Pharmasuiss Zagreb. Unrestricted research grant from Roche d.o.o. Zagreb. ER: Research support from Theravance, Daiichi, Replidyne. Consulting services for Pfizer, Bayer, Wyeth, Teva, Replidyne, Schering Plough, Atox, and BiondVax. VGF: Research funding from Theravance, Merck, Nabi, Inhibitex, Cubist, and the National Institutes of Health. Consulting for Astellas, Biosynexus, Cubist, Inhibitex, Merck, Johnson & Johnson, and is on the speakers’ bureaus for Cubist and Pfizer. ICE Registry Investigators 2007: David Gordon MBBS, FRACP, FRCPA, PhD, Uma Devi MD (Flinders Medical Centre, Adelaide, Australia); Denis Spelman MD (Alfred Hospital, Amiens, France); Jan T.M. van der Meer MD, PhD (University of Amsterdam, Amsterdam, Netherlands ); Carol Kauffman MD, Suzanne Bradley MD, William Armstrong MD (Ann Arbor VA Medical Center, Ann Arbor, USA); Efthymia Giannitsioti MD, Helen Giamarellou MD, PhD (Attikon University General Hospital, Athens, Greece); Stamatios Lerakis MD FAHA, FACC, FASE, FCCP (Emory University, Atlanta, USA); Ana del Rio MD, Asuncion Moreno MD, Carlos A. Mestres MD, PhD, FETCS, Carlos Paré MD, Cristina García de la María MD, Elisa De Lazzario BSc, Francesc Marco MD, Jose M Gatell MD, José M. Miró MD, PhD, Manel Almela MD, Manuel Azqueta MD, Maria Jesús Jiménez-Expósito MD, Natividad de Benito MD, Noel Pérez MD (Hosp. Clinic—IDIBAPS: University of Barcelona, Barcelona, Spain); Benito Almirante MD, Nuria Fernandez-Hidalgo MD, Pablo Rodriguez de Vera MD, Pilar Tornos MD, Vicente Falcó MD, Xavier Claramonte MD, Yolanda Armero MD (Hospital Universitari Vall d’Hebron, Barcelona, Spain); Nisreen Sidani RN, MSN, Souha Kanj-Sharara MD, FACP, Zeina Kanafani MD, MS (American University of Beirut Medical Center, Beirut, Lebanon); Annibale Raglio MD, DTM&H, Antonio Goglio MD, Fabrizio Gnecchi MD, Fredy Suter MD, Grazia Valsecchi MD, Marco Rizzi MD, Veronica Ravasio MD (Ospedali Riuniti di Bergamo, Bergamo, Italy); Bruno Hoen MD, PhD, Catherine Chirouze MD, Efthymia Giannitsioti MD, Joel Leroy MD, Patrick Plesiat MD, Yvette Bernard MD (University Medical Center of Besançon, Besançon, France); Anna Casey, Peter Lambert BSc, PhD,DSc, Richard Watkin MRCP, Tom Elliott B.M., B.S., B.Med.Sci., PhD, D.Sc., FRCPath (Queen Elizabeth Hospital, Birmingham, UK); Mukesh Patel MD, William Dismukes MD (University of Alabama at Birmingham, Birmingham, USA); Angelo Pan MD, Giampiero Caros MD (Spedali Civili—Università di Brescia, Brescia, Italy); Amel Brahim Mathiron Christophe Tribouilloy MD, PhD MD, Thomas Goissen MD (South Hospital Amiens, Bron Cedex, France); Armelle Delahaye, Francois Delahaye MD, MPH, FESC, Francois Vandenesch MD, PhD (Hopital Louis Pradel, Bron Cedex, France); Carla Vizzotti MD, Francisco M. Nacinovich MD, Marcelo Marin MD, Marcelo Trivi MD, Martin Lombardero MD (Instituto Cardiovascular, Buenos Aires, Argentina); Claudia Cortes MD, José Horacio Casabé MD (Instituto de Cardiología y Cirugía Cardiovascular, Buenos Aires, Argentina); Javier Altclas MD, Silvia Kogan MD (Sanatorio Mitre, Buenos Aires, Argentina); Liliana Clara MD, Marisa Sanchez MD (Hospital Italiano, Buenos Aires, Argentina); Anita Commerford MD, Cass Hansa MD, Eduan Deetlefs MD, Mpiko Ntsekhe MD, Patrick Commerford MD (Groote Schuur Hospital, Cape Town, South Africa); Dannah Wray MD, MHS, Lisa L. Steed PhD, Preston Church MD, Robert Cantey MD (Medical University of South Carolina, Charleston, USA); Arthur Morris MD, FRCPA, David Holland MD, David Murdoch MD, DTM&H, FRACP, FRCPA, FACTM, Katherine Graham MD, Kerry Read MD, Nigel Raymond MD, Paul Bridgman MD, Richard Troughton MD, Selwyn Lang MD, Stephen Chambers MD (Canterbury Health Laboratories, Christchurch, New Zealand); Despina Kotsanas BSc (Hons), Tony M. Korman MD (Southern Health, Clayton, Australia); Gail Peterson MD, Jon Purcell BS, Paul M. Southern, Jr. MD (UT-Southwestern Medical Center, Dallas, USA); Manisha Shah MD, Roger Bedimo MD, MS (Dallas VA Medical Center, Dallas, USA); Arjun Reddy, Donald Levine MD, Gaurav Dhar MD (Wayne State University, Detroit, USA); Alanna Hanlon-Feeney, Margaret Hannan MD, BCh BAO, MSc, MRCPath, FRCPI, Sinead Kelly MD (Mater Hospitals, Dublin, Ireland); Andrew Wang MD, Christopher H. Cabell MD, MHS, Christopher W. Woods MD, MPH, Daniel J. Sexton MD, Danny Benjamin, Jr. MD, MPH, PhD, G. Ralph Corey MD, Jay R. McDonald MD, Jeff Federspiel, John J. Engemann MD, L. Barth Reller MD, Laura Drew RN, BSN, L.B. Caram MD, Martin Stryjewski MD, MHS, Susan Morpeth MBChB, Tahaniyat Lalani MD, Vance Fowler, Jr. MD, MHS, Vivian Chu MD (Duke University Medical Center, Durham, USA); Bahram Mazaheri PhD, Carl Neuerburg, Christoph Naber MD (University Essen, Essen, Germany); Eugene Athan MD, Margaret Henry BSc (Hons), PhD, Owen Harris MD (Barwon Health, Geelong, Australia); Eric Alestig MD, Lars Olaison MD, PhD, Lotta Wikstrom, Ulrika Snygg-Martin MD (Sahlgrenska Universitetssjukhuset/Östra, Goteborg, Sweden); Johnson Francis MD, DM, K. Venugopal MD, DM, Lathi Nair MD, DM, Vinod Thomas MD, DM (Medical College Calicut, Kerla, India); Jaruwan Chaiworramukkun MD, Orathai Pachirat MD, Ploenchan Chetchotisakd MD, Tewan Suwanich MD (Khon Kaen University, Khon Kaen, Thailand); Adeeba Kamarulzaman MBBS, FRACP, Syahidah Syed Tamin MD (University of Malaya Medical Center, Kuala Lumpur, Malaysia); Manica Mueller Premru MD, PhD, Mateja Logar MD, PhD, Tatjana Lejko-Zupanc MD, PhD (Medical Center Ljublijana, Ljublijana, Slovenia); Christina Orezzi, John Klein MD (St. Thomas’ Hospital, London, UK); Emilio Bouza MD, PhD, Mar Moreno MD, PhD, Marta Rodríguez-Créixems MD, PhD, Mercedes Marín MD, Miguel Fernández MD, Patricia Muñoz MD, PhD, Rocío Fernández, Victor Ramallo MD (Hospital General Universitario Gregorio Marañón, Madrid, Spain); Didier Raoult MD, PhD, Franck Thuny MD, Gilbert Habib MD, FACC, FESC, Jean-Paul Casalta MD, Pierre-Edouard Fournier MD (Faculté de Médecine de Marseille, Marseille, France); Natalia Chipigina PhD, Ozerecky Kirill MD, Tatiana Vinogradova MD, PhD, Vadim P. Kulichenko PhD (Russian Medical State University, Moscow, Russia); O.M. Butkevich PhD (Learning Medical Centre of Russian Presidential Affairs Government, Moscow, Russia); Christine Lion MD, Christine Selton-Suty MD, Francois Alla MD, PhD, Hélène Coyard, Thanh Doco-Lecompte MD (CHU Nancy-Brabois, Nancy, France); Diana Iarussi MD, Emanuele Durante-Mangoni MD, PhD, Marie Françoise Tripodi MD, Riccardo Utili MD (II Università di Napoli, Naples, Italy); A. Sampath Kumar MD, Gautam Sharma MD (All India Institute of Medical Sciences, New Delhi, India ); Stuart A. Dickerman MD (New York University Medical Center, New York, USA ); Alan Street, Damon Peter Eisen MBBS, MD, FRACP, Emma Sue McBryde MBBS, FRACP, PhD, Leeanne Grigg (Royal Melbourne Hospital, Parkville, Australia); Elias Abrutyn MD (Drexel University College of Medicine, Philadelphia, USA); Christian Michelet MD, PhD, Pierre Tattevin MD, Pierre Yves Donnio PhD (Pontchaillou University, Rennes, France); Claudio Querido Fortes MD (Hospital Universitario Clementino Fraga Filho/UFRJ, Rio de Janeiro, Brazil); Jameela Edathodu MRCP, Mashael Al-Hegelan MD (King Faisal Specialist Hospital & Research Center, Riyadh, Saudi Arabia); Bernat Font MD, Ignasi Anguera MD, PhD, Joan Raimon Guma MD (Hospitál de Sabadell, Sabedell, Spain); M. Cereceda MD, Miguel J. Oyonarte MD, Rodrigo Montagna Mella MD (Hospital Clinico Universidad de Chile, Santiago, Chile); Patricia Garcia MD, Sandra Braun Jones MD (Hosp. Clínico Pont. Universidad Católica de Chile, Santiago, Chile); Auristela Isabel de Oliveira Ramos MD (Instituto Dante Pazzanese de Cardiologia, São Paulo, Brazil); Marcelo Goulart Paiva MD, Regina Aparecida de Medeiros Tranchesi MD (Hospital 9 de Julho, São Paulo, Brazil); Lok Ley Woon BSN, Luh-Nah Lum BSN, Ru-San Tan MBBS, MRCP (National Heart Centre, Singapore, Singapore); David Rees MD, Pam Kornecny MD, Richard Lawrence MD, Robyn Dever MD (St. George Hospital, Sydney, Australia); Jeffrey Post MD, Phillip Jones MD, Suzanne Ryan MHSc, GCDM (The University of New South Wales, Sydney, Australia); John Harkness MD, Michael Feneley MD (St. Vincent’s, Sydney, Australia); Ethan Rubinstein MD, LL.B, Jacob Strahilewitz MD (Tel Aviv University School of Medicine, Tel Aviv, Israel); Adina Ionac MD, PhD, Cristian Mornos MD, Stefan Dragulescu MD, PhD (Victor Babes University of Medicine and Pharmacy, Timisoar, Romania); Davide Forno MD, Enrico Cecchi MD, Francesco De Rosa MD, Massimo Imazio MD, FESC, Rita Trinchero MD (Maria Vittoria Hospital, Torino, Italy); Franz Wiesbauer MD, Rainer Gattringer MD (Vienna General Hospital, Vienna, Austria); Ethan Rubinstein MD, LLB, Greg Deans MD (University of Manitoba, Winnipeg, Canada); Arjana Tambic Andrasevic MD, PhD, Bruno Barsic MD, PhD, Igor Klinar MD, Josip Vincelj MD, PhD, FESC, Suzana Bukovski MD, Vladimir Krajinovic MD (Univ. Hospital for Infectious Diseases, Zagreb, Croatia).